Event Materials - Flottman Company. Event materials for the Goering Center’s annual awards program. 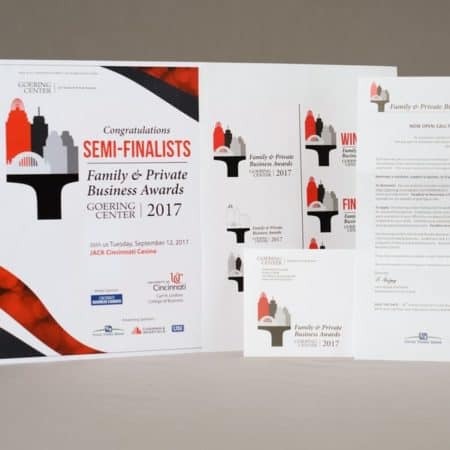 Ensure the Goering Center for Family and Private Business‘s annual awards program is a success by securing nominations, promoting award finalists and printing event materials. Create a unified identity for the awards that ties all materials together. We printed all materials with bright, bold colors to ensure the pieces would stand out. The awards were a huge success this year and we are looking forward to helping the program continue its growth. The goal of the Goering Center for Family & Private Business is to help family and private businesses succeed through programming, events, roundtables and more. As a member of the center, Flottman Company is proud to support the center with our commercial folded printing abilities. One of our big projects with the center is assisting with their annual Family & Private Business Awards. This includes printing mailers, flyers, certificates and stationery, designing trophies, creating press releases and more. We even redesigned the awards logo! 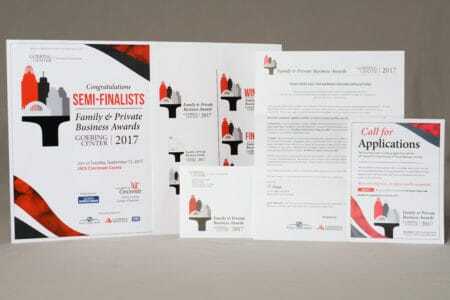 The Goering Center relies on us to create a unified image for these awards, and our commercial folded printing expertise allows us to exceed expectations. We are always happy to help the center recognize local businesses for their success and achievement. We are honored to have received both their Family Business of the Year and Family Business of the Decade Awards at past award ceremonies. The nomination mailer, awards badges, and semi-finalist info packet. An important aspect of this program is ensuring that companies apply and/or are nominated for the awards. To assist with this, we created and printed a mailer to send out to members of the center. The mailer asked them to apply for the awards or nominate another deserving business. It included a letter with information on the application/nomination process as well as an application/nomination form. We also printed the branded envelope that was used to send the mailer. Additionally, we designed and printed semi-finalist, finalist and winner badges for recipients to wear during the event. Along with this, we created information/media packets for all finalists and winners. These packets included social media and web badges that enabled them to advertise their accomplishment online. 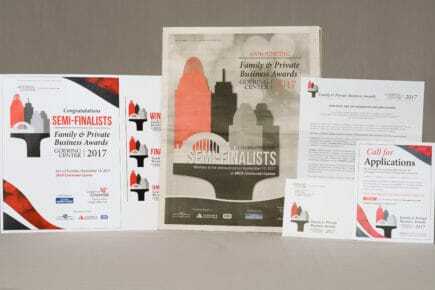 All printed materials for the awards were printed, cut and folded in-house, allowing for quick turn-around times and clear communication. Could our digital printing help you save money on your next commercial printing and/or folding project? Request a quote today!